Good Morning All! And Happy Friday! I'll be spending my day trying to catch up on House work and Blogging obligations. And hopefully I may even get around to decorating the bare Christmas tree that's been sitting in or living room all week. 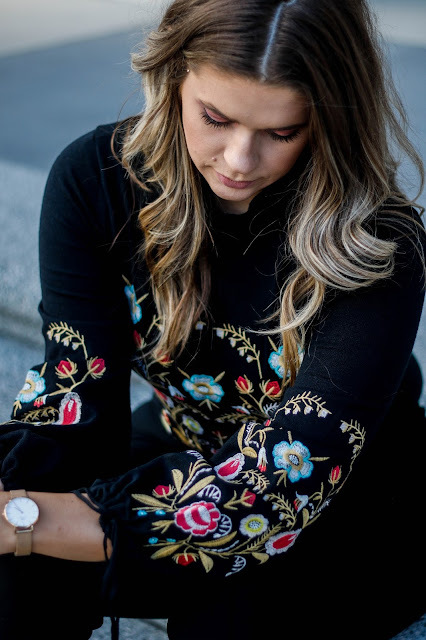 But, before I hop into all of that I thought I would procrastinate a little bit by sharing this cute new top and some fun Christmas Gift ideas! 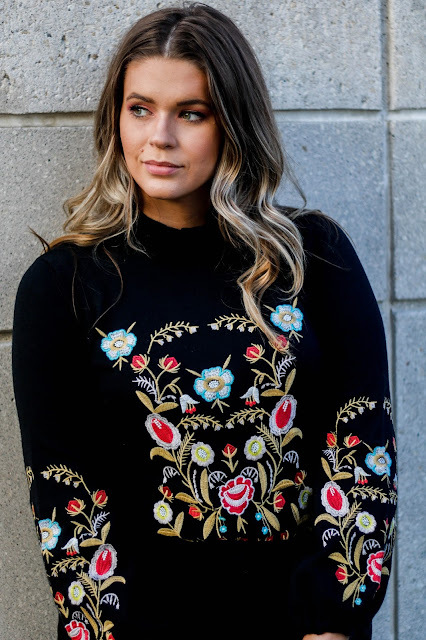 I grabbed this super cute top last week and I am obsessed with the bright floral embroidery on it. Personally, this is one trend that I'm glad to see going strong throughout the year. I loved my embroidered gingham and chambray over the summer and now that we're getting back into the deeper shades and heavier textures, I'm still flower obsessed. 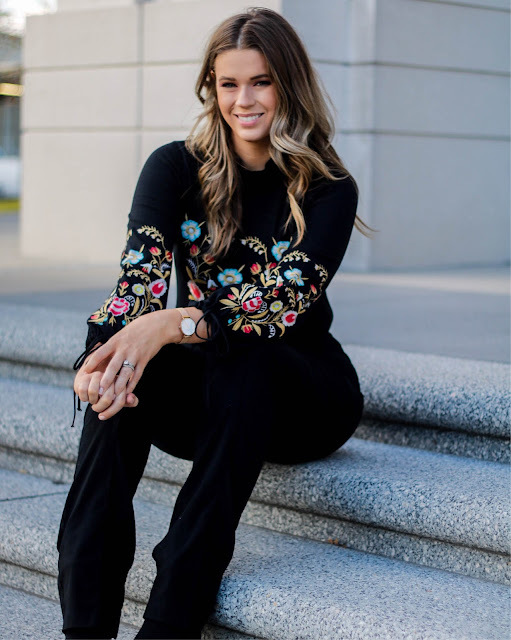 This top has a high neck, a snug fit and the cutest gathered sleeves. My only recommendation would be to check the length measurement if you are a tall girl. I could have done with an extra two inches on my longer torso. But, that's just personal preference. You can grab it HERE for under $30 and see how other fashionable ladies styled it as well. I LOVE that some of them styled it over a white button down. I need to try that next! 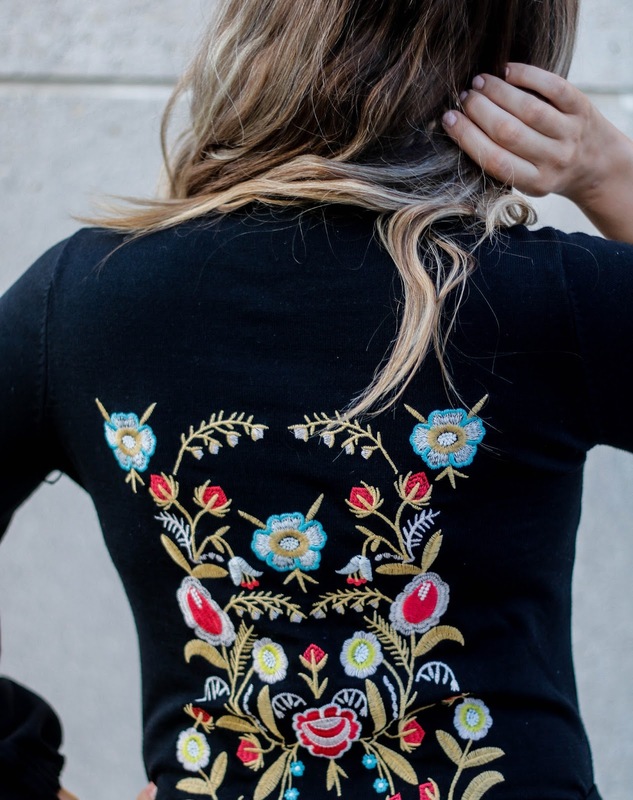 Now, so we have a little bit more to talk about than just my obsession with embroidered flowers, I thought I would share some fun ideas for Christmas gifts for your Bestie! You can check out any of these pieces, just by clicking on the photo in the collage! You all know I'm beauty obsessed, so I love the idea of spoiling your favorite person with some of your favorite things. If I could stock my girls up on my favorite products I'd throw in a beauty blender, the Jacklyn Hill Pallette and the best drugstore mascara on the market, at the moment. 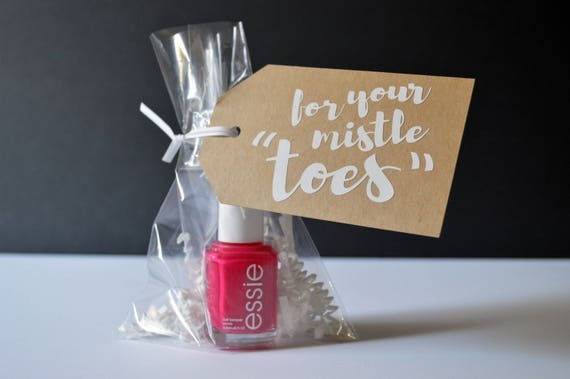 (Cheaper Options could be your favorite Nail Polish wrapped in some adorable packaging! I also love the idea of spoiling them with a luxury item, that they normally wouldn't buy themselves. Most people don't want to spend $40 on a tube of lipstick, but it's still cheap enough that you can treat your beauty loving BFF to one without breaking your bank! I'm all about funny gifts! And since me and my girls all enjoy a glass of bubbly now and then I think this Prosecco Pong Game and Might Be Wine Tumbler are amazingly hilarious! Over the last few years most of my best girl friends have moved around the country which puts most of our interactions into daily group texts. And one thing that we're constantly talking about in our group is our favorite T.V. Show, Outlander. Every Sunday night we catch up and chat about the show and what we thought of it. So, I think getting them an Outlander themed gift is the perfect nod to our shared love for time traveling romance! Obviously, this is an idea that can be suited to your own likes and obsessions. We all know life gets tough sometimes. So why not send some encouragement in the form of your favorite uplifting book. If you've read something lately that has lifted your spirits or filled your heart why not spread that around? We could all use a little positivity, especially around the holidays! Girl these are definitely great gifts for friends, I want them for myself though!